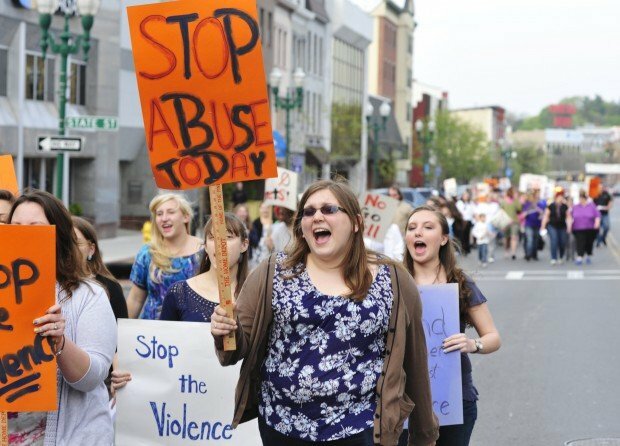 Wells College student Emily Mulkerne, 21, marches on Genesee Street during the "Take Back the Night" rally Wednesday to raise awareness about domestic and sexual abuse. 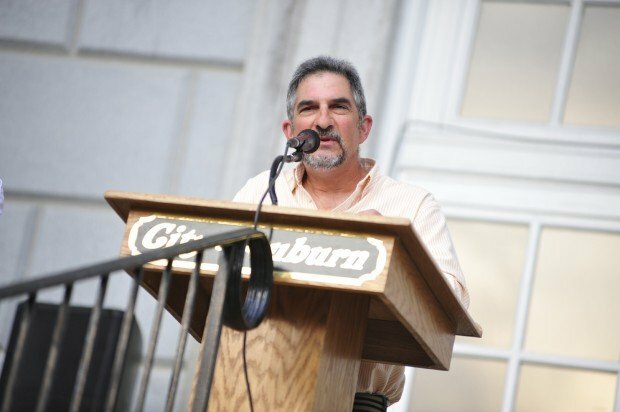 John Socci gives an emotional speech about the 2011 murder of his daughter Katie Socci during the "Take Back the Night" rally. Jennifer Socci holds her 5-year-old daughter Bella close while her father John Socci gives an emotional speech about 2011 the alleged murder of her sister Katie Socci, in a suspected domestic violence attack. Mary Lambdin, left, 13, and her Girl Scout troop, display signs saying "Take Back the Night" in front of Memorial City Hall in Auburn on Wednesday. AUBURN | On an average evening in Auburn, a clothesline isn't usually strung across trees and lights in front of Memorial City Hall. Then again, Wednesday night was far from an average evening. Last night, Auburn took back the night. As the sun began to its slow descent, nearly 300 community members — of all genders, ages and races — flocked to City Hall for Auburn's annual edition of "Take Back the Night," an international movement determined to fight domestic and sexual violence. Prior to the march, the attendees stopped to read the rainbow's worth of shirts swinging in the taught line strung in front of the hall. The shirts, created by survivors of domestic and sexual violence, share some of the reasons residents lent their support. Written in the hands of both children and adults, the shirts read, "Hands off my body," "Don't touch kids in a bad way unless you want to go to jail" and, simply, "Be safe." Holding up a sign advocating the buddy system, 7-year-old Josiah Raymond marched down South and West Genesee streets, crowing about staying safe. "I like to do this job," Josiah said, smiling. "It protects the people. I want to protect the people." Tammy Raymond, Josiah's mom, said she first brought her son to a Take Back the Night rally when he was just 6 weeks old. As a longtime attendee, Raymond said she wants to give her children a look at the support, acceptance and education provided at Take Back the Night. "I have a very strong philosophy that our children are mirror images of what we teach them," she said. Following the march, attendees gathered in front of City Hall for testimonials from survivors, acappella performances by three Wells College singing groups and calls for an end to violence from local dignitaries. Cayuga County Sheriff David Gould said he's pleased to see attendance swell in the 20 years Auburn has hosted the rally. Speaking to men — the gender the sheriff said are responsible for 95 to 97 percent of domestic violence cases — Gould made it clear he would not tolerate abuse. To curtail violence, Gould asked men to take a stand. "Have the courage to recognize when something is wrong," he said. "Have the guts to stop your friend, your relative from violating a female." District Attorney Jon Budelmann encouraged the community to work together to let victims of violent crime know they are not alone, to tell them they can get justice. "We will fight to protect them, to hold their abusers accountable," Budelmann said. "They will no longer be anonymous." John Socci spoke about the unimaginable pain he felt when Katie Socci, his 29-year-old Auburn daughter, was murdered last year in what he said was a case of domestic violence. He said the unimaginable support his family received from the community showed him how lucky Auburn residents are to live in such a caring, supportive community. Knowing firsthand how the community will respond, Socci encouraged victims of domestic and sexual crime to reach out. "I want everybody to know, if you're hurting, help is available," he said. Staff writer Samantha House can be reached at 282-2282 or samantha.house@lee.net. Follow her on Twitter at Citizen_House.